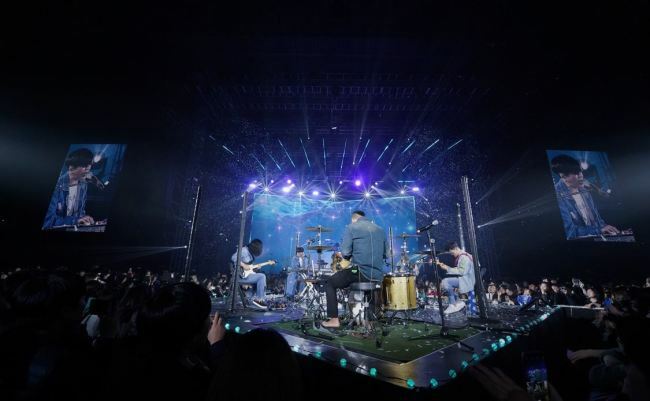 Wrapping up a whirlwind of a year with ear-splitting rock sound, over 4,000 concertgoers at YB Band’s Seoul concert either let go of their bygone days or brought up long-buried emotions with the band’s thought-provoking songs and stories. If there’s any reason why people chose the veteran rock band over younger and trendier musicians for their year-end concert, it’s probably the band’s masterful onstage tricks that it has crafted for over two decades and its ever-developing musicality. 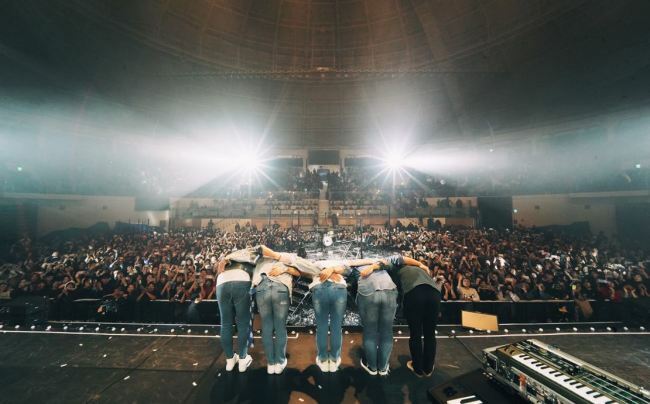 And YB Band, in its 22nd year and fronted by vocalist Yoon Do-hyun, knew exactly how to live up to those expectations, presenting the crowds one of the most enjoyable and meaningful nights of this year at its Seoul concert that was held at Jangchung Gymnasium on Saturday. The performance was the band’s last leg of its nationwide tour series titled “Momentum” that kicked off on Nov. 17. Throughout the three-hour set, the veteran rock band successfully balanced out its set list by seamlessly blending heavy metal and light balladry sounds, leaving fans enough energy to sit through the night. Yoon, the energetic and versatile vocalist, also didn’t forget to offer words of advice to his fans by shouting out, “Guys, do whatever you want in your life” between the songs. While each stage was distinctively memorable and Yoon’s explosive vocals were impressive as always, what especially grabbed the attention was the soaring seven-minute long guitar solo by guitarist Heo Jun on “Dreamer,” which drew out gasps and chills from rock enthusiasts. Heo’s stunning collaboration with guitarist Scott Hellowell during “Headache” was another special treat for fans. “I think we are very lucky and grateful to be able to keep pursuing what we want. We don’t want to become a band that stays in the past. 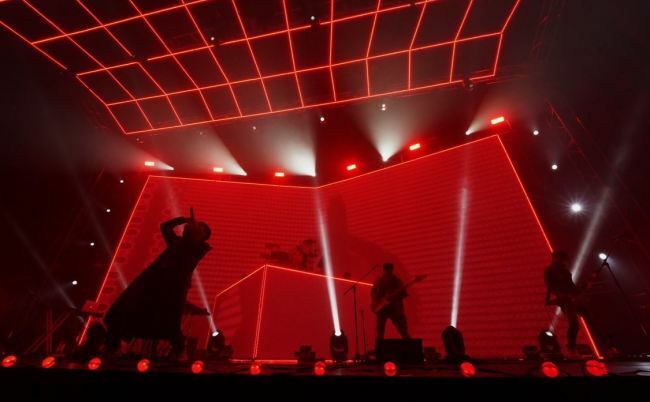 We will always stay on stage and pursue newness,” said Yoon as the night neared its end. Having debuted as one of Korea’s most iconic rock bands in 1996, YB Band in April became one of the Korean musicians that have performed in Pyongyang as part of a series of cultural exchanged agreed upon by the two governments. The band is set to work on its 10th full-length album next month, according to its Dee Company.